Random killing has, ironically, become a way of life for the Mafia. Its targets used to be confined to those who were a direct threat to the organization’s business interests or families. But it sees that this brutal empire is becoming less fussy about who it hits to make a point. The trail of New York Mafia boss John Gotti is a prime example. 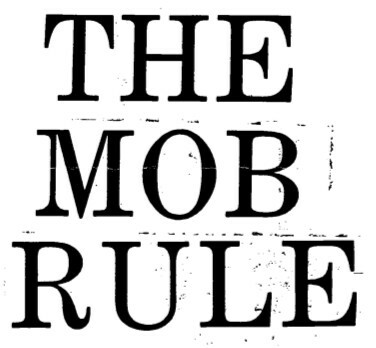 The shooting of a mob turncoat’s sister – the only connection being that she was unfortunate enough to be a relative – during the trial is a warning to others not to break the organization’s sacred code of silence. There’s no doubt that when Mafia members turn informant to save themselves from prison, they risk a lot more in the process. So it was a calculated risk for two relatives of former top American Mafia boss Sam “Mooney” Giancana to write an incriminating expose abut him and his international Outfit, even though it is more than 15 years since he was shot dead, possibly by one of his own. Mooney’s younger brother, Chuck, and nephew Sam changed their names from Giancana years ago to prevent any association with the mobster family from Chicago and to enable them to lead relatively normal lives. In their book, Double Cross, taken from Mooney’s conversations with Chuck – his main confidant – over the years, they not only show the violent world of the Mafia, but also an intimate portrait of a Mafia family. Feat is nothing new to Sam, who grew up in the shadow of this all-powerful godfather. “I was terrified of him all the time. He had this stern scowl, he wasn’t’ comfortable among children, he didn’t know how to play. He controlled people by intimidating them” – Sam Giancana on his godfather, Mafia boss Sam “Mooney” Giancana. “I was terrified of him all the time. He had this stern scowl, he wasn’t’ comfortable among children, he didn’t know how to play. He controlled people by intimidating them. Sam’s mother stood by and watched it happen. “That show how much power he wielded. You were caught up in the fear,” Sam says. Now living in Florida with his wife, Bettina (author of Double Cross) Sam, 37, is not how you would imagine a mafia godson to be. Mild-mannered and quietly spoken, he and his wife run a marking communications company specializing in health education. In the book, Chuck Giancana claims that Mooney’s Outfit was behind the deaths of Marilyn Monroe and President Kennedy. He says Mooney helped JFK’s presidential victory through mob finance and rigged ballots – thinking it would ultimately give him greater power. He would own the president. What actually happened was that after the Kennedy’s had received all the help they needed from Mooney, Bobby Kennedy, the Attorney General, had a purge on organized crime. This outraged his Mafia backer, who became bent on revenge. Chuck Giancana says that through phone tapping and surveillance, Mooney monitored Monroe’s affairs with first Jack Kennedy and then Bobby, and set out to expose the brothers – which would have effectively ruined their careers. Bobby went to Monroe’s California home the day she died to tell her they’re affair was over. That night four men hired by Mooney went to her home and killed her – using a lethal suppository of barbiturates. Mooney hoped the murder would expose the romance and implicate the Attorney General. What he didn’t bank on, Giancana says, is the huge cover-up that Kennedy’s FBI aides carried out. So Mooney made arrangements to have the president assassinated. The decision to write the book came after Chuck went through by-pass surgery several years ago, and started to contemplate his mortality, Sam says. Double Cross: by Sam and Chuck Giancana with Bettina Giancana is published by Macdonald, price ££16.99.